We watch movies for different reasons—sometimes to go on a journey, sometimes to fall in love, and sometimes to scare our pants off. Horror Film Spotlight focuses on the ones that keep us up at night, whether they star restless ghosts or psychotic ax murderers. Some are spooky and some are gory, but they’re all full of that shadow-in-the-doorway, voice-in-the-dark sense that something’s just not quite right. And what’s scarier than that? Pro tip: if you find a new storybook on your child’s shelf—one that you can’t remember seeing, let alone reading, before—maybe, just this once, a book burning is in order. But what could be dangerous about the pop-up Mr. Babadook? Plenty, as it turns out; after reading the book to her son Sam (Noah Wiseman), Amelia Vanek (Essie Davis) starts sensing a new presence in her house. Unable to prove anything to the police, she and Sam are forced to deal with disturbing phone calls, shadowy figures, and increasingly graphic threats illustrated in the seemingly indestructible book. Because here’s the thing about the Babadook: the longer it’s ignored, the stronger it grows. And once you let it in, it never, ever leaves. Like our first Horror Film Spotlight, Mama, The Babadook also delves into the darker side of motherhood. This time around, though, it’s the human who has the problem, not the monster. Amelia loves her son, but there’s no denying that Sam is a disturbed and off-putting kid who’s isolated his mother from her friends and family. The true conflict of the film isn’t between Amelia and the Babadook but between Amelia and Sam—you’ll be on the edge of your seat wondering if they’ll team up in time to save each other. Also be on the lookout for cool practical effects and simple-yet-eerie set designs. 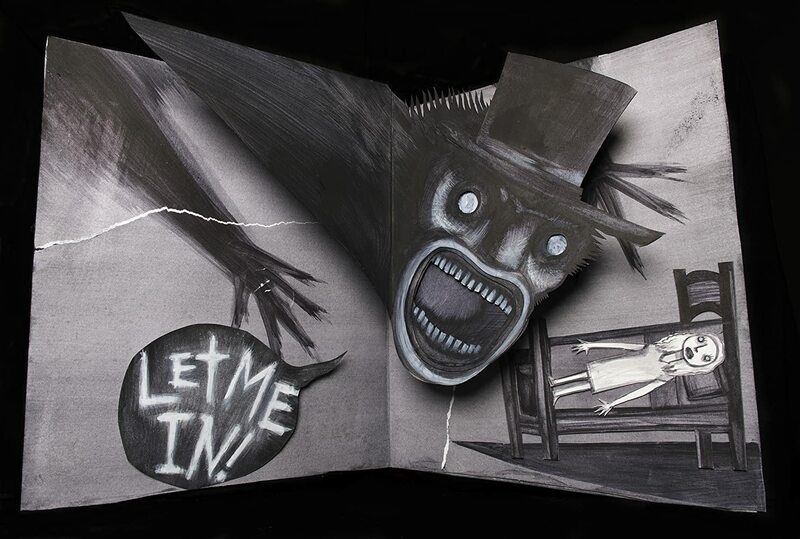 It’s not quite as fast-paced as Mama, but The Babadook is just as atmospheric and unsettling. If it’s in a word. Or it’s in a look. You can’t get rid of…the Babadook. Have you seen The Babadook? What did you think?